So it was encouraging to learn from Sonja Lyubomirsky, a psychology professor featured in the film, that only 10% of our happiness is dependent on our life circumstances (like where we live or how much money we make). Turns out a full 40% can be changed by intentional activities. 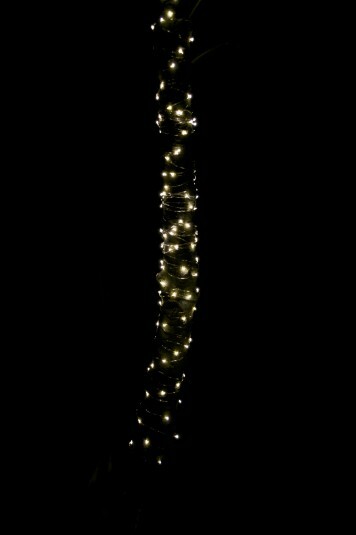 Hmmmm….like wrapping the tree trunk out front with small starry lights to help bring a twinkle to long November nights? It’s a small thing but it makes me happy to see them. Another thing that makes me happy this time of year is dreaming of the upcoming holiday season. A lot of my pondering is around the food, no surprise. The sweet treats that I make only this time of year, yes. But also the small savory bites, the canapés that arrive with the glass of bubbly before dinner. 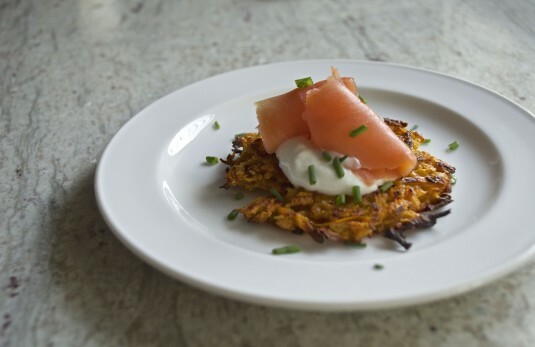 So, how about some sweet potato latkes to help kick off this holiday season? This is a good way to combine fall flavors into not just one but two upcoming holidays next week — a rare occasion that has (American) Thanksgiving and Hanukkah falling on the same day this year. I experimented with two different methods for cooking latkes: One, the traditional frying on top of the stove, and two, by ‘oven frying‘ on a foil-lined baking sheet. Did I prefer one method over the other? Each had its merits: The oven fried method (results on the left in the photo above) was simple and obviously better for minimizing the smell of frying oil in the house. And, by tossing out the foil lining, cleanup was a breeze despite not being very environmentally friendly. The traditional frying in a sauté pan method (results on the right) did require more active time standing over the stove but it gave a crisper and, surprisingly, less oily result. So I’ll be turning my hood fan on high and opening the windows again the next time I make these latkes. (And maybe lighting up a scented candle or two once I’m finished frying. Mom would be proud.) And since I adore smoked salmon with a glass of bubbly, that’s what I’ll top them off with, along with a dollop of Greek yogurt. They’re also great with a simple spiced pear compote, as shown in the first photo. The recipe for the compote is included below. Here’s to launching a happy holiday season. 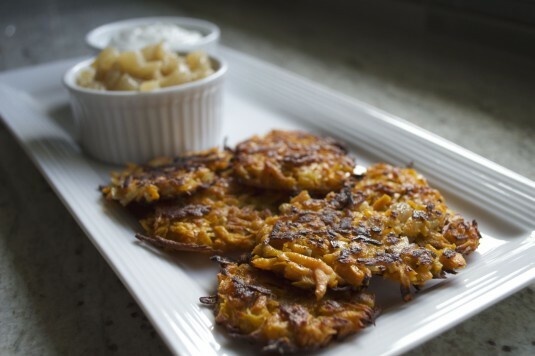 These are a delightful twist on traditional latkes, and work well topped either with smoked salmon or the spiced pear compote. If you're frying these on top of the stove, I'd recommend keeping your kitchen well ventilated. Coarsely shred the sweet potatoes in a food processor or with a hand grater. Squeeze out the excess liquid from the shredded sweet potatoes, and place in a large bowl. Add shallots, eggs, flour, baking powder and salt and pepper. Mix well to combine. For stovetop cooking: Heat 1 tablespoon olive oil in a sauté pan over medium heat. Spoon 2 tablespoons sweet potato mixture in the pan for each latke, probably 3 or 4 latkes at a time. Don't crowd the pan, as they need enough space between them to crisp up. Fry on one side for about 1-1/2 minutes, or until bottom is lightly browned. Turn over with a spatula and continue to cook for another 1 to 1-1/2 minutes or until lightly browned. 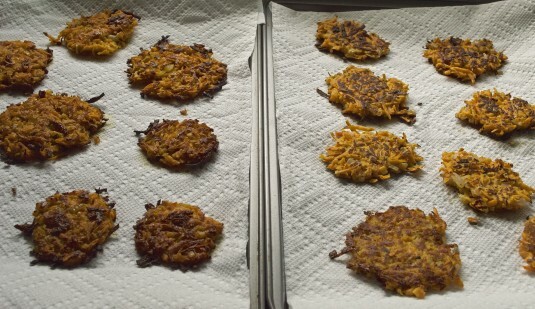 Remove latkes from pan and place on a paper towel-lined tray. 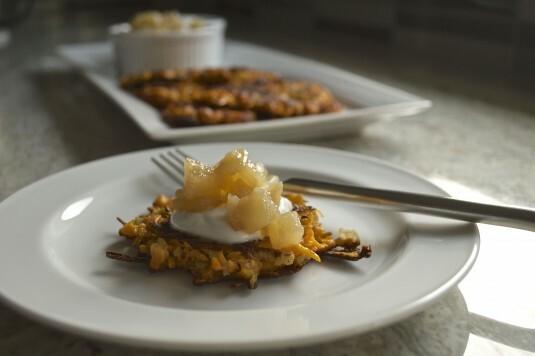 For serving, top each latke with a dollop of sour cream or Greek yogurt, and a small spoonful of spiced pear compote. Combine pears, sugar, water and cinnamon stick in a medium saucepan over medium heat. Cover and heat 3-4 minutes or until compote comes to a slow boil, then reduce heat and simmer 10-12 minutes, or until pears are soft. With a wooden spoon, press on some of the pieces to make the compote less chunky.